Who said we had money. We raced on a well below budget and raced for tea towels as they said in those days. No need to crop them, really. He was a bit thinner at that stage....But then again, weren't we all...? As a panel-beater, I had plenty of weekend work. Only one car - everyday and race car. S/H tyres @ 30 bob each...etc. And we didn't run into each other! David hi, Do you know who is in this Buckle... He was never thin. And thats why your a multi millionaire now. Working all of those jobs, Yeh right with the last three. Edited by BUCKLECOUPE, 15 March 2016 - 03:14. And thats why your a multi millionaire now. Here is some of the flag marshals... Anyone recognise them. Edited by BUCKLECOUPE, 15 March 2016 - 05:57. I'll look mine up & post it to see how close we were standing when we took the photos. Turns out, the other bloke had crawled into my body....it's my shot!!!! I posted it on here around 2011. Been around the interweb for a few years, & now it's come home to daddy!! Good photo if I do say so. Here's the original. 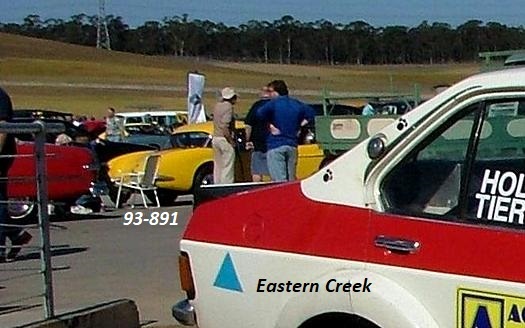 Well bugger me, there I am doing my Fire Marshell/Cars past our point Observer job at the exit of CC Tyers corner, I am the one in white overalls face on to camera, about 19 years of age, so many years ago, thanks. I've become quite philosophical about my photos reappearing. If they don't come back, they might be not that good!! Besides, I post these things so that it gets people talking about what we're all interested in. how many of your photos appear. It's also of note how well you recognize your own stuff in among all the others. That's Brian Barby's Holden-engined Anglia you are watching. Far later than that we raced for a bag of oranges! 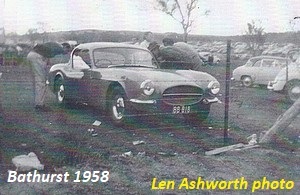 I have a few photos from Castlereagh drag (CAMS days) with Append. J cars, etc similar to this one. Do you want to see this type of racing here. Can anyone tell me car and drivers name. Edited by BUCKLECOUPE, 16 March 2016 - 03:38. It is all motorsport history. 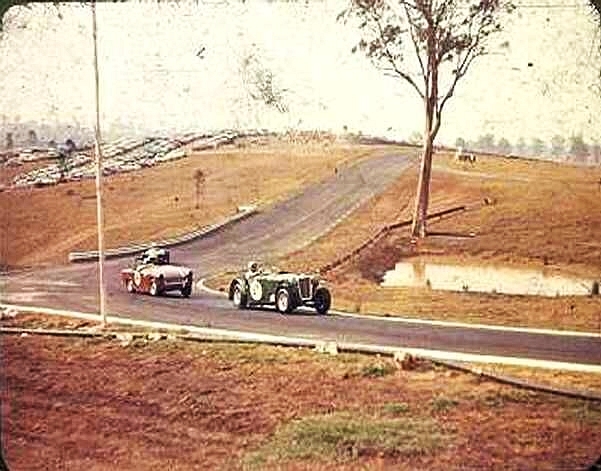 1/4 mile sprints [as they were] road racing, dirt oval, hillclimbs and motorkhanas dirt sprints, mud sprints are all a part of our history. I have done all of them at various times as well as organised drag racing. As have a lot of others too. Is that one of the 'Gold Cigars' ? CAMS, in their wisdom, decided there would be no drag racing here. Only sprints, with one car at a time, were permitted. 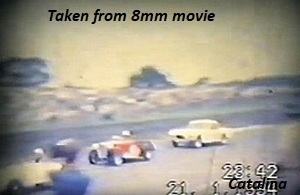 That was when the Hot-Rod Association took on CAMS, and ran drag races anyway. A phrase frequently seen. Rarely seen un-ironically. Your memory going Lee? Or maybe mine! I thought it was a bag of apples! From an apple grower in the hills. Doig tried very hard to win those - to feed his horses. Edited by 2Bob, 16 March 2016 - 03:10. 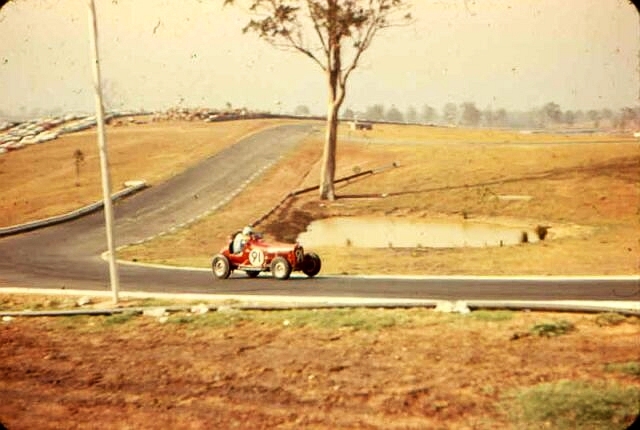 If by chance Bob's latest is from the August 1960 Castlereagh 'NSW Sprint Championships' then 123 is John Bruderlin MG.
And yes, please post more. Yep, the Bruderlin MG was a 'Gold Cigar'. You can tell him I don't think he's changed a bit! You may be right,, and yes my memory is going! I know that the ones I won I handed to someone else immediatly. It may have been Doig,, to feed his wifes horses. That is a picture of someone working very hard! In a car that is not working! Unfortunately a lot of my slides are in poor condition. 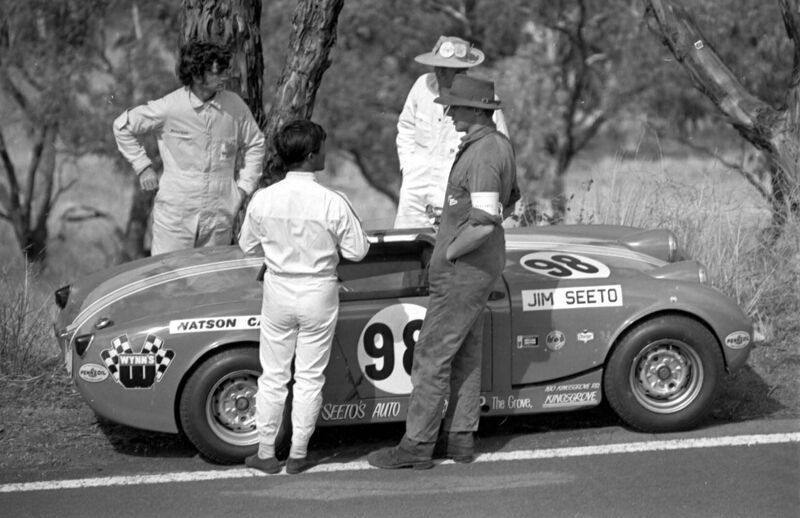 I should add, as Greg would confirm, that George was President of the Singer Car Club, which morphed into the NSW Road Racing Club and which operated the Oran Park ciruit. Edited by Ray Bell, 16 March 2016 - 23:12. 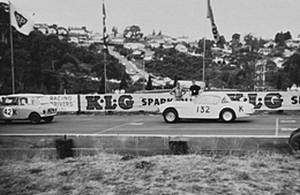 When the 2.2-litre models were allowed to join the Touring Car ranks in Australia, just two cars were available in the country. One was a new one, which Jim McKeown bought, the other had a different history. A friend of Alan's had won Tattslotto and was able to buy a Porsche. Alan felt it was a bad move for him, that he should use the money to get himself a house and stabilise his life a bit. Then Lowe's phoned Alan and told him this bloke was enquiring about a new Dino Ferrari. 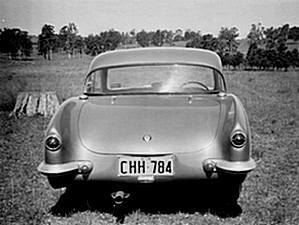 Alan relented and ordered especially for him the most expensive 911 to come to Australia to that time, among its extras being an electric sunroof. It didn't last long and he realised he had bitten off more than he could chew and back-traded, so Alan had this car to sell to Foles. The sunroof had to go, so an aluminium panel was rivetted in place and made look good. It still has this today. Alan has no idea about the 911R script on the back. 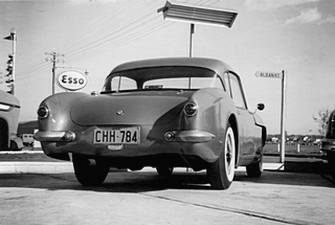 He did fit the engine from the Spyder and run it as a Sports Sedan. But he says that has nothing to do with the '911R' on the back. I've never seen that one, I'm sure. Entered by J. (John?) Evans and K. (Kevin?) Salmon, it looks to be TD or TF based. Saturdays photos early. Set of 3 photos from Catalina Lemans start. Foley's Sprite (you can see his helmet on top of the roof of the Buckle) then a Morgan, Lawler's Buckle followed by MGAs and Sprites... 2nd photo showing, the Morgan has jumped out first and the Turner not so quick off the mark. Edited by BUCKLECOUPE, 18 March 2016 - 21:43. And it looks like Frenchy is a bit slow on his feet in that last pic. I note that there are two Le Mans starts on that page, one in the dry and one in the wet, which is the one in which Rich died. And there's a photo there of his fatal crash. Edited by BUCKLECOUPE, 19 March 2016 - 21:04. Catalina 19-5-63.. Sad day in Australian Motor racing as we lost a young race driver. Not sure if this was the 1st or 2nd Le Mans start race that day. Was it raining am or pm. As you can see it was raining when he crashed. 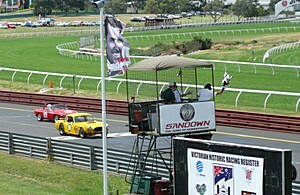 If you look at Bruce Wells 2 photos of both races, the flags have disappeared from the flag poles behind the race cars. Edited by BUCKLECOUPE, 22 March 2016 - 01:47. The crash had occurred just before I got to the circuit, and I wasn't very late. Race two, I would think, out of the day's programme. Now there is the ultimate race car,,, a Mk1 Consul. With a bonnet scoop to feed the 1500? I guess they did not break as many axles as a Zephyr but still roll over just as often. Probably because the left side wasn't sealed to the fence but the RHS was. The Rich accident was Event 2, as discussed back on page 201 of the old thread - refer post 10029 on - after Bob posted the Foley Sprite photo.. 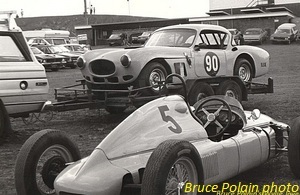 The Bruce Wells photo for the ill-fated Le Mans start meeting relates to the one shown in post 7 of the trs thread. 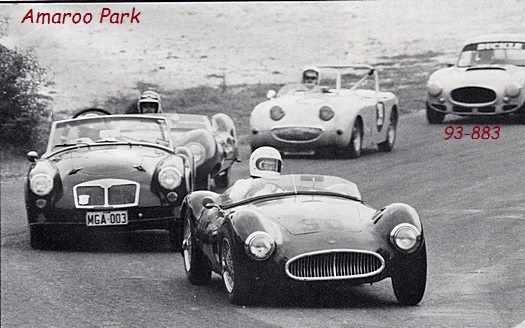 The dry Le Mans sports car race in Post 6 of the trs thread is quite possibly the March 1962 Catalina meeting event 10. 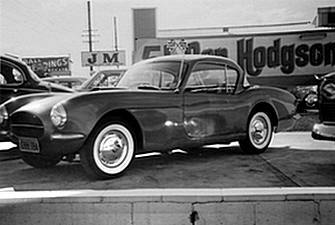 I'm basing this on the #64 Healey being Pedro Owen's and the #48 MGA being the Aitken/Caddy entry. I had a 'Le Mans' start on that same day [19/5/63], although we started from the pits side...not like the above photos. For some reason - I think it was because it was thought that we wouldn't do up our seat-belts - we used a 'runner' to deliver the ignition key, from the other side of the track. The drivers were belted up, ready to start, when handed their key. That Zephyr or Consul is Appendix K , I wouldn't be surprised if if was V8 powered . 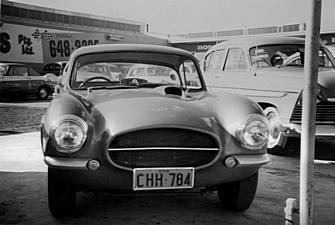 That Zephyr or Consul is AppendiAs soon as they put the bonnet-scoop onx K , I wouldn't be surprised if if was V8 powered . Edited by seldo, 20 March 2016 - 02:13.